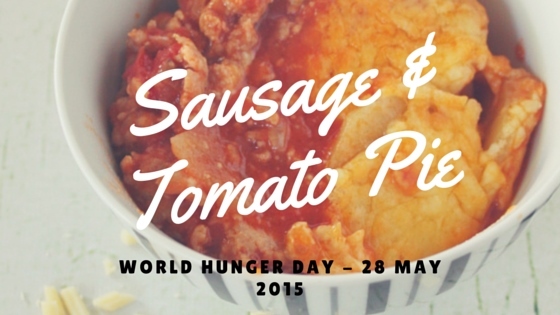 Did you know that May 28th is World Hunger Day? I didn’t either, until I was recently asked to contribute a recipe as part of a World Hunger Day campaign called ‘Come Dine Below the Line‘ which is being run by The Hunger Project and MyVoucherCodes. The idea is, that the recipe should be below the poverty line and cost no more than 33p per head. It’s not easy, let me tell you! I’ve based my costings on ingredients from Sainsbury’s, for no other reason than the fact that it’s my local supermarket and where I do my grocery shopping. A couple of bits of prep to start. Firstly, chop your onion and then squeeze all of the sausage meat out of your 8 sausages. I find the easiest way to do this is to twist it in the middle and then push the meat out towards each end. A bit of kitchen roll helps with this too. Now, gently heat your oil in a large saucepan and sauté your onion until it has softened. If you’ve got a bag of peas in the freezer then these make a great accompaniment – or to keep the cost down even more, any veggies that you grow in your garden!